If you simmer the pork chops too long, they will get dry and tough. Goes well with jasmine rice, plain green beans and baked acorn squash or sweet potatoes. It also works well on a bed of fresh spinach. Salt and pepper both sides of the pork chops. Cook in oil until both sides are browned. Add everything else. Lower heat and simmer 20 minutes. Take out pork chops and keep warm (This is important!). 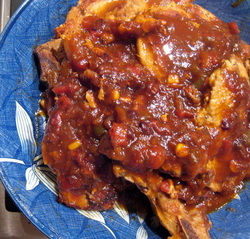 Reduce the sauce over high heat until it is the consistency of syrup. Pour over chops and eat.